Clams and polenta need nothing more than a spicy tomato sauce and hungry dinner guests. Savor the Silver Coast of Tuscany with Acquacotta, the new cookbook from food writer and blogger Emiko Davies. This is one culinary region where tradition reigns supreme — and believe us, it ain’t broke and don’t need fixing. Learn the techniques and recipes from this magnificent food culture, like this vongole e polenta, and use them to freshen up your own repertoire. This recipe calls for a creamy, pillowy polenta base, made with fioretto or fine-round cornmeal. Much like fluffy mashed potatoes, this starchy, comforting staple needs love and care (and the right seasoning) for a good result. It takes a bit of time, but if you’re at the stove anyway, checking on the tomato sauce and preparing these clams, you won’t even notice having to give the polenta a stir every 4–5 minutes. Polenta should be well salted, but for some good seafood flavour you can add some grated bottarga to the polenta instead of salt. There are some brilliant shortcuts for cooking polenta. Italian food writer Anna del Conte has a technique where, after 10 minutes of stirring the polenta in a pot on the stove top, she transfers it to a buttered ovenproof dish and bakes it, covered, for 1 hour. While the top retains a crust (much like the crust that forms around the pot during stove top cooking), it protects the soft polenta underneath. In her book Simply Ancient Grains, Maria Speck suggests another solution that only requires remembering to start soaking ahead of time. Pour boiling water over the dry polenta and cover it with plastic wrap, ensuring that the plastic is touching the entire surface so that it doesn’t develop a skin. Let it sit for 8–12 hours (or even 2 days in the fridge). Then, when ready to cook, add more water, bring it to a simmer and cook, while stirring, for 10–12 minutes. Rinse the clams quickly under water, weed out any with crushed shells (tiny chips or cracks are usually fine) or that are open and don’t move when touched or squeezed. (Rule of thumb: if they are open before cooking, they’re dead. If they don’t open after cooking, they’re dead. Throw them away). Purge the clams, if necessary, for at least 1 hour (see ‘Purging Clams’). And regardless of whether or not you’re purging, do not skimp on step 5. In a saucepan, heat the garlic gently in 2 tablespoons of the olive oil. Add the chili and the tomato, along with about 1 cup of water, and season with salt. Let it simmer for 30 minutes or until slightly reduced. To prepare the polenta, bring 4 cups of water to the boil in a deep, non-stick pot, add the salt (or grated bottarga) and the remaining tablespoon of olive oil. Pour in the polenta slowly while stirring (I like a wooden spoon, others like a whisk) to avoid lumps; stir for 1–2 minutes until the mixture thickens. Turn the heat down to the lowest setting possible and cook gently, covered (but giving a vigorous stir every 4–5 minutes) until it is creamy and silky and it begins to come away from the sides of the pan. It’s useful to have a small saucepan of simmering, salted water nearby to add in spoonfuls if the polenta looks too thick or lumpy when stirring. Taste it too – the polenta should be completely soft, with no bite to it, at about 45 minutes. Cover with plastic wrap, ensuring that the plastic is touching the entire surface so that it doesn’t develop a skin. Set it aside while you prepare the clams. Place a frying pan or saucepan with a lid over high heat. When very hot, add the drained and cleaned clams, followed by the white wine. Let them cook for 1–2 minutes, then cover and let the steam open up the clam shells. Shake the pan occasionally. After 1–2 minutes, check the clams – they should all be opened. At this point you can choose to remove the shells – pluck the clam meat out of their shells, discard the shells but add the meat and their juices, along with the herbs, to the tomato sauce. Or you can leave the shells intact, as I do – it looks better and I don’t mind getting my fingers dirty during the meal. 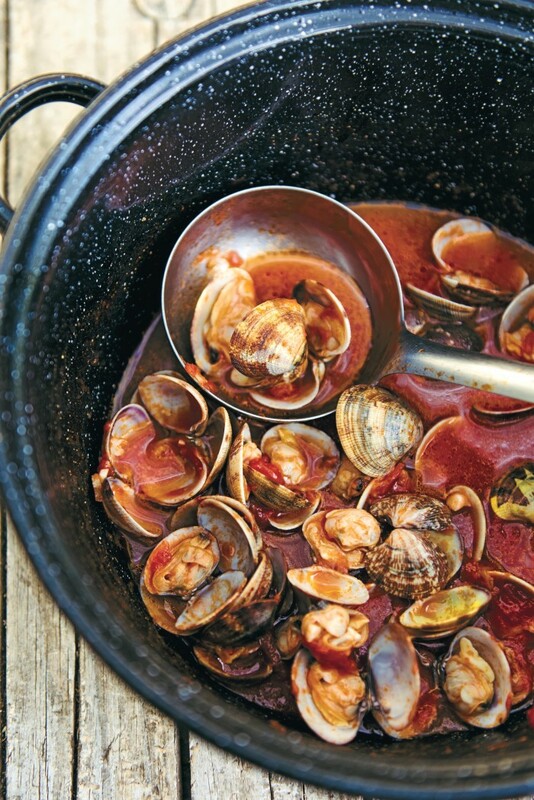 Portion out the warm, creamy polenta into shallow bowls and ladle the clam stew over the top. Serve immediately.